Want to know more about our Policies and Accreditations, see below. The Company has achieved an enviable reputation as a leading design and print business, a reputation that we are determined to see continue and grow by the continual development and improvement of our management systems. This will be achieved by the introduction and discussion of quality and environmental objectives during each Management Review. We are committed to using only the best products and methods, complying with all relevant legislation and codes of practice and to giving the best possible service in order to meet our customers’ current and future requirements. 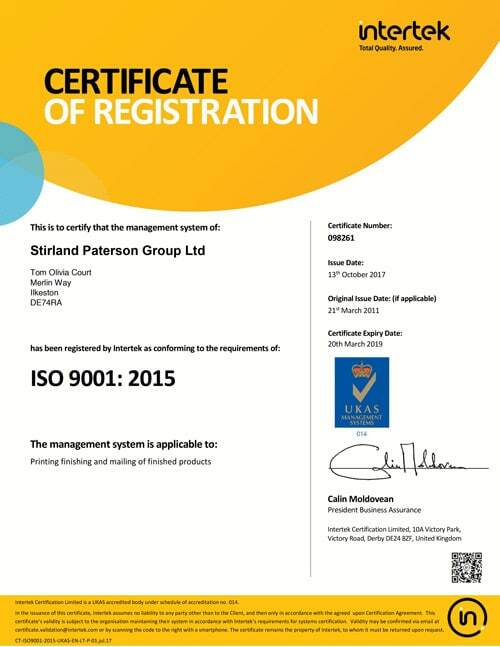 In order to achieve and maintain this policy and commitment, we have introduced quality and environmental management systems into our operations that meet the requirements of the international standards ISO 9001:2015 and ISO 14001:2015. We will continue to be assessed for ongoing compliance against these standards by a UKAS accredited third party certification body. The environmental management system will ensure that we comply with all applicable legal and other requirements and that our commitment to continual improvement of the system is maintained. We will assess the environmental impacts of our operations and, where practicable, reduce our use of raw materials and energy in order to reduce or prevent pollution. In addition, we will encourage our suppliers to operate in a similar manner. All employees know, and support, this policy and work to ensure that it is implemented, maintained and improved where possible and practicable. Where necessary, employees will be trained in environmental issues as they affect our business activities. Top management, in conjunction with senior personnel, will review this policy at least annually to ensure that it remains current and relevant to the Company’s operations and our customers’ expectations. We take environmental responsibilities very seriously. We’ve already come a long way in reducing our impact on the planet and we’re continuing to work hard to make a difference. We constantly assess the way we work to minimise the use of energy and natural resources throughout the business. We keep our staff up to date with greener ways of getting the job done, to put waste segregation processes in place to facilitate recycling and reduce waste sent to landfill. 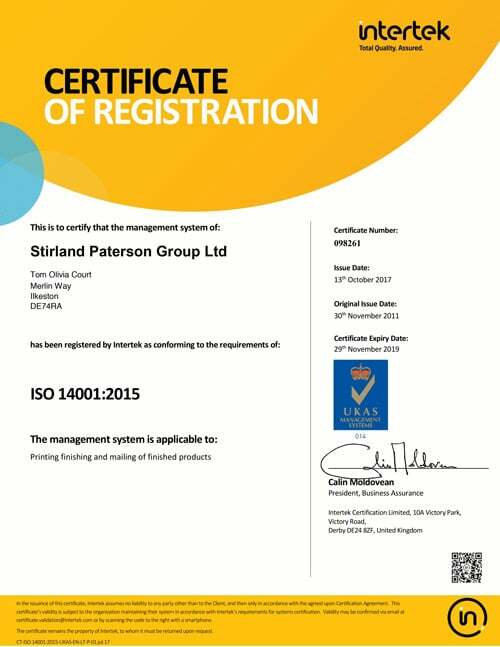 Our environmental management system has been assessed against, and approved to ISO 14001:2015. This system ensures that we comply with all relevant legislation and codes of practice and that our commitment to continual improvement is maintained. It ensures that we assess the environmental impacts of our operations and reduce raw material and energy usage. We set environmental objectives and targets and ensure that our employees support and achieve these objectives. We encourage suppliers to operate in a similar manner. We provide a carbon-balancing scheme in co-operation with the World Land Trust. 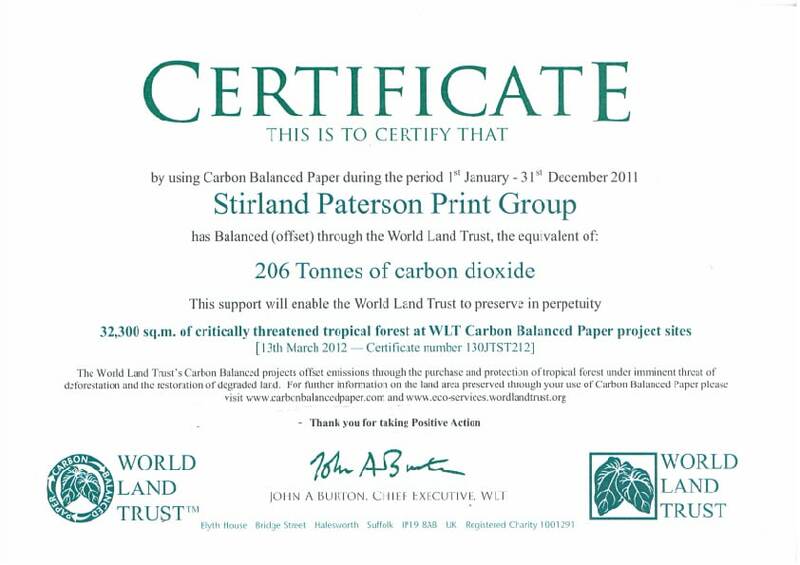 Most of the paper we purchase is carbon balanced, or offset by the World Land Trust. Carbon Balancing by the World Land Trust tackles climate change through projects that both offset carbon dioxide (CO2) emissions and conserve biodiversity. 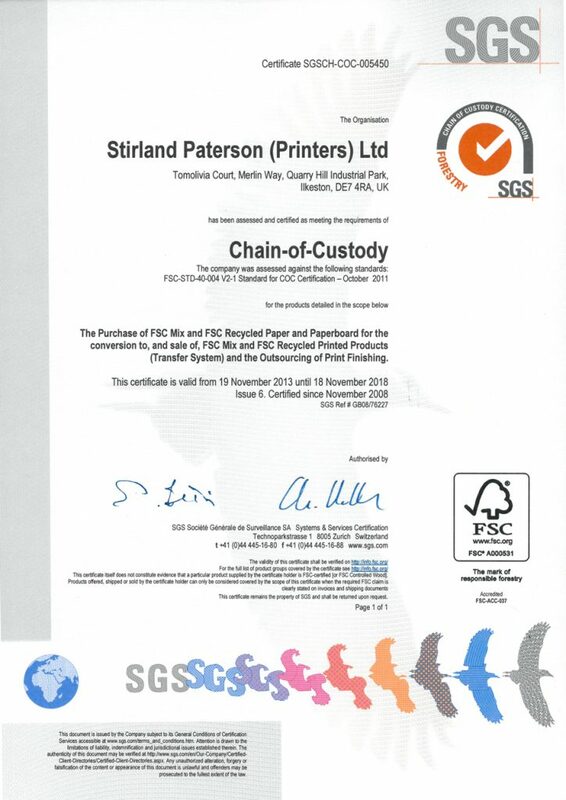 Stirland Paterson gained the FSC® Chain of Custody Certification in November 2008. The FSC® logo is your guarantee that our paper is sourced from well managed forests. By obtaining COC certification Stirland Paterson can demonstrate our commitment to being more economically, environmentally and socially responsible. You can find out more about FSC® by visiting www.fsc-uk.org or by talking to one of our sales team. We are working on improvement plans to reduce power and water use and to cut down on packaging waste. Our delivery vehicles are replaced regularly and our despatch department accommodates multidrops to maximise efficiency and reduce our carbon footprint. To find out more about how we make a difference to our customers, as well as the planet, call us now on: 0115 944 7600.